As we can see generating x-shore names is a popular among all kind of companies even established players such as capgemini and eds jumped on band-naming wagon. It won’t take long till someone trademarks smartshore or ezshore or put a copyright on the word shore – too bad all nautical charts would have to be reprnted… Other companies find using shore words too mundane and invent their own words and phrases such as Chindus Strategy (China-India-US) or BRIC-sourcing. And Me2 – with my term of Disposable Outsourcing. Hey, why not? That’s somewhat akin to starting companies in the dot-com era – the more confusing it was the high the chances VCs would be all over it … Well, let me tell you, there is no best shore when it comes to IT, there is no best of all shores, and there is no silver bullet. By all means why would anyone outsource if they could deliver on their obligations without headache of dealing with geographically distributed culturally remote third parties? During those good old days when a Ph.D. from a 3rd world country was only $8K a year cost advantage was so profound that that it was practically impossible to resist the temptation of outsourcing. Today if Ph.D. is asking for $40K the chances are s/he bought the diploma on some black market. With average saving of mare 20-30% it’s not about cost advantage anymore, we go offshore for variety of reasons, goals and objectives. Defining those should be your first step before you even consider vendor search and daunting task of picking perfect destination. “If a man knows not what harbor he seeks, any wind is the right wind.” [Seneca] It should be set of your own objectives, reasons and goals specific to you organization, not taken verbatim form some book or my blog (even though I think you can find a lot of helpful ideas in Top Reasons for Outsourcing or My Reasons to Outsource). I can’t tell what shore is going to be the best for you, chances are it is different from what is best for some of the vendors knocking on your door, but one thing I am sure of – chose it wisely. We are free to a point of choice, after that the choice controls the chooser. Fact # 1. 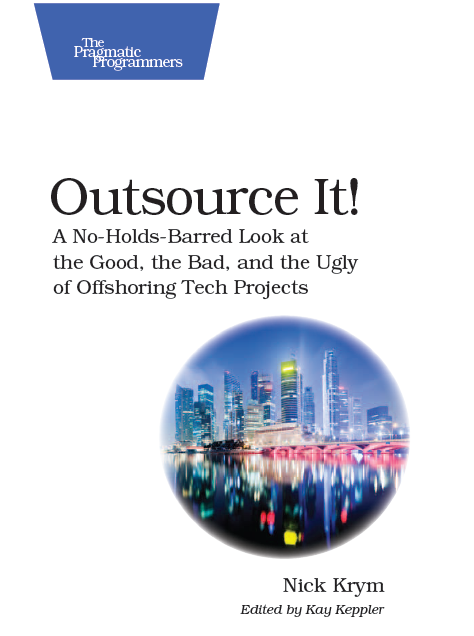 Offshore outsourcing is costing U.S. jobs. This myth has been debunked so often that by now we should strongly believe in its opposite. Supposedly someone very trustworthy institution calculated that for every dollar spent on a business process that is outsourced to India, the U.S. economy gains at least $1.12. An easy way to fix the economy, isn’t it? Should we pass the idea to the new administration? Well, I am not planning on questioning this global statement. What I can say with certainty is that every outsourced IT job is a local IT opportunity lost. Fact # 2. The cost benefits of outsourcing are overstated. I touched on this subject in several earlier posts (e.g. Outsourcing Myths: cost advantage). The reason I wrote on the topic is exactly that “the cost benefits of outsourcing are overstated”. I would not call IT outsourcing “the best story ever sold” yet there is a large portion of exaggeration to almost every offshore vendor presentation I’ve ever seen. Fortunately many of buyers came to grips with the fact that on any meaningful scale IT outsourcing can at best save 20-30%, if handled well. Fact # 3. There are “huge” cultural barriers. For anyone who’s been through any substantial outsourcing initiative there is nothing mythical about cultural barriers. The fact that they are not necessarily huge and sometimes only subtle doesn’t make them easier to deal with. Especially now when “IT outsourcing” doesn’t equal “Outsourcing to India” underestimating complexity and challenges associated with cultural differences can trip over otherwise bulletproof engagements. Myth 1: India is the best destination for IT outsourcing. India is a leader in IT outsourcing no matter what angle you look at – sheer volumes, number of providers, process maturity, breadth and depth of service offering and so on. It doesn’t make India the best destination in every case though. In particular India is farshore destination for European and US-based companies vs. nearshore option provided by Eastern Europe or Latin America correspondingly. There are other Cons to India as the destination (take a look at Pros and Cons of Outsourcing to India). Growing competition from almost every country in the world cuts into India market share and offers multiple alternatives to buyers across the world. Myth 2: Offshoring is the best strategy for cutting costs. Offshore outsourcing is just one of the strategies that companies can use deploy in tough economic climate. There are many areas that should be considered by the companies looking for bottom line improvements. In many cases the steps should include rationalization of IT portfolio, SDLC and other process improvements, usage of tools, etc. Offshoring is a very powerful weapon and as other ones is a double-edged sward. Myth 3: Offshoring drives IT salaries down. Offshore outsourcing is of course a contributor and plays its role in salary dynamics, it is however less important factor than other elements of the economy and geography. The areas that are affected the most are actually wages of “local outsourcers” – freelancers, contractors, etc. Take a look at oConomy you will see some staggering trends catering to the concept of “flat world”. Hit with homesourcing many US freelancers had to drop their rates to what market is ready to pay nowadays. On the other hand some comp. packages increased in size: consider for example rates you need to pay people running distributed engagements. Myth 4: Offshoring will result in significant unemployment in the technology sector. Similar to salary dynamics offshoring affects employment trends, and so far did not deliver the impact feared. High-end IT professional continue to be one of the scarcest commodities in the world, even low-end IT workforce still remains gainfully employed in a large degree despite huge economy downturn. It remains to be seen how far IT unemployment figures would go and would be the geographical distribution. Myth 5: Quality of offshore IT operations is lower than in the US. That is almost as bad of a generalization as they get. As a matter of fact having seen IT operations in many companies in this country and some of the best operations offshore I can say that there is much to be learn from IT companies in China, India and other countries. As a matter of fact how many CMMI5 companies are there in US and how many in India? It would be interesting to see average maturity across IT outfits in different countries. Myth 7: Offshoring is a never ending nightmare. Funny enough I hear this one more and more often nowadays. Yet when you deep dive into the reasons behind nightmare they often point much more towards the organization outsourcing the IT tasks rather than to the vendor. As I said many times it takes knowledge and skill to apply outsourcing tools to the benefit of your organization. You can not get rid of a problem by throwing offshoring at it. Organizational inefficiencies such as broken communications are only amplified by outsourcing and can result in the nightmares. I am an avid proponent of open communications and believe the more partners know about each other the better are the chances for the partnership to be successful. There are still a lot of things that you should keep to yourself for the same general reason – to increase the chances of the partnership being successful. 1. Game plan. Negotiations are an ongoing part of business relationship – not just the talks around the contract. Keep you card close to the chest and never disclose the game plan, even far after the game is over. Disclosing decision making process will limit you ability to use “high authority” negotiation gambit that is a powerful technique for getting more in negotiations. The last thing true decision makers need is all might of vendor sales force targeting them through every sales channel. 3. Budget. I always give my vendors an indication of the budget but never exact figures. One of the main reasons to keep it private is the nature of budgets – they change, funds get reallocated, etc. And of course something to be said about negotiation upper hand with less information at your partner disposal. 4. Roadmap. Product and relationship roadmaps should be shared with your vendor only at a very high level. Details should not be communicated for many reasons – business counterintelligence and agile nature of the roadmaps (similar to budget note above) being the most important. You probably have an NDA in place, that’s already a strong reason to keep your lips sealed. The runner-up competitor today can be a vendor of choice tomorrow. You do not know what kind of back-end links your vendors have in place. 6. IP / Know-how. If you must share anything of that nature make sure that the information distribution is governed / controlled tightly. The vendors with the best intention have little power over disgruntle employees – the prime venue of information leak. Employ distribution of the information on a Need-to-Know basis. 7. Confidential information. Same as above applies to many aspects of your business, internal and external (e.g. customer data). Consider rules associated with on handling ePHI (electronic protected healthcare information) or financial information and penalties associated with its mishandling. This is a very comprehensive topic; I will cover it in a stand-alone post. 8. Dirty Laundry. Sharing it with your vendor can hurt you in many ways; in particular consider the scenario of the relationship gone sour for any reasons; won’t you prefer your ex-partner to know as little about you as possible? 9. Personal details. Do not get close and personal with the vendor / vendor employees. There are many ways it can end up costing you more than you bargained for. There is no harm in sharing you “public” personal details (married, three kids lived in Bay Area all your life, etc.) but sharing little known data may put you in a difficult situation. I find LinkedIn to be a good idea generator for blog topics, for example a question from Vinay Joshi “.Net OR Java what technology projects you outsource — Does technology matter for making decision to whether outsource or not? …” deserves substantial discussion, beyond my brief answer on the site; especially considering that the rest of answers are more about religious war of .Net vs. Java rather than about the question itself. Of course the answer depends on the context, if you are a technology company that already has the technology selected or a vendor that has a large team with specific expertise in place the discussion has little relevance. For those about to outsource it could be quite important decision though. Flexibility offered by technology is not your friend. The more discipline the technology offers / requires the easier it is to control it, the less are the chances on-shore and off-shore teams drift apart. In particular using Java vs. .NET discussion – Java offers great flexibility and far less commonalities in solving even basic development task. There is always 10,000 ways to achieve the same objectives. It offers multiple schools of thought and competing technologies. .NET offers more disciplined approach, while it offers some flexibility it’s far less the focus or the modus operandi, typically in .NET there is “the right” way of dealing with majority of tasks. Emerging technologies are not made for outsourcing. That seems like a no-brainer, yet I’ve seen many companies moving projects using cutting edge technologies offshore, typically with painful consequences. So just in case, there are many reasons not to do so: lack of experienced resources, blind spots in understanding the technology on the both sides of the ocean, insufficient supporting community and documentation, undeveloped best practices, etc. Each of these issues by itself can destroy the engagement, when the issues combined the failure is guaranteed. Both Java and .NET by themselves are established technologies, however there is always something new being pitched by the respective camp. Close doors to Open Source. Well, that might be too strong of a statement. As a matter of fact I did quite well outsourcing development using Open Source technologies and products and so many people I know. Caveat emptor! If you go for Open Source make sure that you do not stray off the beaten track and stick to very stable and mature products with strong development community. Too frequent release cycle, fluctuating quality of products, unstable supporting community can add insult to injury when combined with inevitable issues of outsourcing. You can only find free cheese in a mouse trap. In development today there are a plenty of “very simple” technologies. Those technologies could be quickly learned, and superficial or even spurious expertise sold to a naïve buyer. That usually attracts gazillions of providers and inevitably drives the price down. Have you heard about PHP freelancers for $4 an hour? Just go to elance.com or guru.com – you will find a plenty. The chances are you will get what you paid for. The main point here is while the technology at question could be extremely solid it doesn’t mean that any code monkey can operate it. Finding good providers in such technologies could be a challenging task due to the high pollution of the field. Unfortunately PHP today falls into that category, and I am certain tomorrow that will be the case with RoR.